Provides a snug comfortable & functional fit. Is the OA FullForce Brace right for me? Ideal for active individuals recovering from a ligament strain. Try our Brace Advisor for personalized product recommendations to meet your needs! The DonJoy OA FullForce off-loads the affected compartment of the knee while reducing ligament strain. 3-Point Off-Loading mechanically shifts the painful joint loads from the degenerative compartment to the healthy compartment, while the hinge allows the ability to fine-tune the load. 4-Points-of-Leverage is clinically shown to reduce ACL strain by keeping the knee in a stable position to minimize further cartilage damage. Knee braces are available that are specifically designed to treat OA. They stabilize the joint, help reduce pain and help to build stronger muscles, which allows patients to return to the activities they love. Load redistribution and joint alignment Through a process called "off-loading" or shifting, OA braces helps relieve pain by redistributing the weight bearing load on the painful or affected compartment of the joint to the healthy or unaffected compartment. 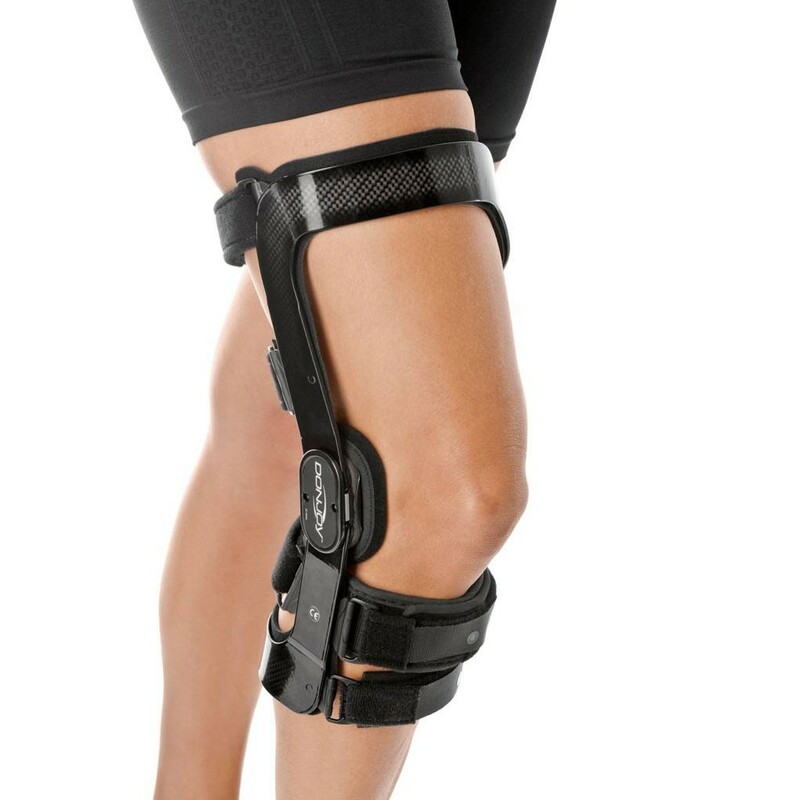 Hello I have this brace, when I run or walk alot with it the straps leave a rash, is there a knee sleeve i could wear under this brace to reduce irritation? I am returning to soccer after acl repair and patela graft, so I will be using it alot.. I have this brace and I love it and it gets a ton of use. But, the pads on each side of my knee fell off when on the move and have been misplaced is there anyway I can get a replacement for those? My measurements are 20.5 thigh, 17 knee and 15.5 calf. the calf and thigh are within the medium range, but the knee is in the large range. Which size will work? Based of the measurement we would go with the medium as the swelling might go down on the knee. I am an 18 1/2 on the thigh, a little short of 14 on the knee center, and a 13 1/2 on the calf. Could you kindly recommend which size would be better suited for me between a small and a medium? Thank you! A size small will be the most appropriate for you to order the DonJoy OA FullForce. Each of your three measurements fall within the small size. Can this brace be wore outside pants? Also my knee is full of arthritis. The brace can be worn on the outside of pants, however you may have issues with the brace sliding. It will fit better and function better directly against the skin. I think I have OA, but I'm not sure if it's medial or lateral. Which brace is right for me? Well if you do not know which side , use the area where pain is located to guide you. If the inside of your knee hurts then get the medial brace if the outside hurts then get the lateral brace. The upright will go on the opposite side fof the pain. We do not accept insurance as payment through the website. To have your insurance cover the brace please follow this link to find your local Don Joy sales rep. They can bill your insurance company for the brace and give you information on coverage. Hi, I'm 37 years old and had a medial meniscectomy 2 years ago. I play beach volleyball 2 times a week. I have been using the Donjoy Playmaker II for over a year now , but lately I have been experiencing some medial pain in my knee after playing and was looking for better medial offloading support. Which brace would be best for me? Thanks. The OA Nano is a good light wieight OA brace that is worn by active folks. The brace can offload the medial side of the joint to decrease some of that pain. I have a DonJoy OA FullForce knee brace unloading my medial meniscus. I notice a clicking (actually 2, but the first click is the hyperextension lock. This click can be felt and heard (rather quiet). The unknown click happens during flexion. It's the right side hinge. Is this just the hyperextension lock "locking then unlocking" or something wrong? I do a lot of surfing and need a brace that is waterproof. Which braces are waterproof? Thanks! I have multiple sclerosis that has affected the muscles in my right leg to the point where I cannot prevent my right leg/knee from "locking/hyperextending" with every step. In addition, my leg "caves inward" from the knee whenever I bend it, such as sitting down or doing a squat. In other words, whenever I try to squat down my right knee "travels" significantly to the left. Because of this combination, I now have a constant ache on the inside of my right knee that sometimes radiates to the front of it. My orthopedic has proscribed a range of motion T-scope brace. Do any of the OA braces have ROM locks to prevent the leg from completely straightening (i.e. locking/hyperextending)? What would be your recommendation for the lightest weight brace that could potentially bee worn on the outside of slacks/jeans? Our OA braces can limit extension by adding an extension stop to the hinge of the brace. Most of the braces come with a 10 degree extension stop to limit hyperextension, but a 20 or 30 degree can be substituted. Also our braces are meant to be worn against the skin not on the outside of pants. The OA Full Fource is 20 ounces and low profile also the OA Nano is only 14 oz. Looking for a brace for my wife who has had 2 medial meniscal surgeries on her left knee in 2 years. Now she has cartilage damage and bone on bone contact in the same knee on the medial femoral condyle. Which brace would be better for her? I was thinking about getting her the OA Full Force brace. Would that be a good one for her and do I get the medial off-loading option? She is quite active at the gym. I have lateral compartment degeneration on both knees. I need to get two braces right and left. My question is the OA Fullforce low profile enough that the braces will not catch between the knees? I want to get back to being able to ride a bicycle and know that I can come to a stop and be stable on my legs. I can not do that right now. The DonJoy OA FullForce knee brace comes standard with a swooping thigh, which meas that you can wear abrace on both legs without the braces hitting each other. I have bone on bone contact on my right knee for many years, my cartilage was removed in a surgery years ago when that was the norm. I have quite severe OA but remain very active all these years. Which OA Full force should I order since I have no cartilage medial or lateral? I got the DonJoy OA FullForce Knee Brace from my Orthopedic doctor. Fits good have some issues with it slipping unless I tighten the straps very tight which does cause some numbness. Question is: the inside material is making my leg very itchy. Are there some kind of pads that I can use for the 3 points that the brace lay against my skin? Don't want a full leg cover. Thanks. I have osteoarthritis diagnosed after MRI. my ligaments are in good shape. I've been doing most of the exercises listed here since I first started w the pain late last year. I had fluid drained late November followed by a cortisone shot and another cortisone shot in December w minimal relief. I am on anti inflammatory meds (Tylenol Arthritis, ibuprofen and turmeric) and take a glucosamine/chondritin/MSM supplement and fish oil. The pain is localized to my inner knee. From reading the info here and the comments, I'm already doing a lot of it. I am also working on losing weight which I know will help. Can you suggest a a good knee brace that will allow me to continue umpiring fast pitch softball which requires squatting and squats to running? I do not want to give it up and my "teams" don't want me to either. Also, do you work with insurance? I am 8 months post-op from acl reconstruction surgery. I am very active and do sports such as football, soccer, tumbling, wakeboarding, and skiing. I am wondering if the FullForce can hold up and protect the acl for all these sports? I am also looking at the Armor. How well will the Armor do? And which is better for the sports listed above? The adjustable hinge will be on the unaffected side. Yours is a lateral off loader, so the offloading hinge is on the medial side. As far as right and left are concerned you can tell by looking at the lower portion of the frame. Look at the arms that extend down from the hinges, you will notice one side is curved in and the other is straight down. The side that is curved goes on the inside of the leg. If you are looking straight on at your brace you will notice the curved portion on the right side below the hinge. Thank you for contacting DonJoy please let us know if you have any further questions. I am a disabled vet who received a Full Force brace for both legs. How can I tell the left from the right in a quick manner? Each brace has a swoop or curved edge in the thigh area. The swoop is on the inside of the brace, so when you put the brace on the swoop should be on the inside of your leg, if it is facing the outside of your leg you are putting it on the wrong leg. They should also have the size marked on each if you pull the inside liner from the top of the frame. I bought the Don Joy Fullforce three weeks ago. I am not sure its the right size. I used the chart and checked it twice. I bought ght size it noted. But the positionjof the pads on the sides seems a bit lower, more towards the lower part of the knee (towards the foot) rather than centered. Is this correct? Or do I possibly need one size larger? If the thigh cuff feels too tight it is malleable so you can pull it out a little as well. 2. Grade II tear of posterior horn of lateral meniscus. Can you kindly suggest a brace so that i can start playing football please. What are the same and different functions between OA nano and OA full force and OA adjuster3 for moderate osteoarthritis?OA nano can push from degenerated cartilage side to healthy cartilage side or not (meaning function like as OA full force knee brace)? I have been wearing this brace for about 6 months and it is wonderful. My wife and I enjoy a trip to the beach each summer and I'm concerned about what effect, if any, the salt water and sand may have on this brace. Will the brace be okay if I rinse it well with fresh water (ie. - hose it off) each evening after we return from the beach? Yes, definitely rinse off the brace with fresh water. Make sure to get into the hinges too, to get all the sand out. Let it dry and re-lubricate the hinges with a dry, teflon based lubricant. Most bicycle chain lubricants fit this description. Thought only replacement surgery was my answer. I just turned 59 and over the last couple of weeks found that I could barely walk due to medial OA (bone on bone). From the moment my therapist placed the DonJoy OA FullForce around my knee and said "walk", I had instant relief. With the brace and a steroid shot, I feel like a new man. I wore this brace everyday for my left medial meniscus tear for 6 months prior to meniscusectomy. After surgery have been wearing this brace for an additional year during exercise. I play tennis and run road races with this brace. It is very comfortable, durable. I feel better with the brace on than without it. I have gone back to have the straps adjusted after the first 6 months to be sure all was in place. I love this brace my doctor calls the 'unloader'. I tell everyone who asks about it.. Go Donjoy! Go! Have had this brace for three weeks. I have been in pain for eight months with arthritis and patella instability. after wearing this brace for three weeks I am absolutely amazed at the improvement in my knee. I can wear it all day. It is so comfortable. Thanks DonJoy. This is an amazing product! I immediately experienced relief from pain when I put the knee brace on. After about a week with the knee brace, I found that the Lycra sleeve worn underneath and a couple strategically placed neoprene straps, I can wear the brace all day comfortably. Getting ready to do some skiing this weekend . . . Unthinkable without the donjoy brace. The velcro straps are fraying and stretching. The brace slips from position under heavy exercise. This brace was fitted by person in Sports Medicine that fits braces for an orthopedic practice. Pros: The frame and hinge are good quality. Your prompt service was appreciated. Cons: The velcro is poor quality. The pad on the upper portion is too big which makes it difficult to feed the strap through the hook. I was surprised how comfortable this brace is, how easy it is to wear during my workouts. Well made and ready to use. Pros: Greatly relieves the bone on bone pain during the day, and even when my knee pops, there is very little pain associated with it, while the brace is on. Cons: Really none. For those observing the brace slipping, just tighten the #2 strap behind the knee a little more.